In the northeastern states of Tripura, Meghalaya, and Nagaland, the BJP has achieved great success in the party office in Delhi celebrating activists. Party cadres are celebrating the occasions. Party leaders and cadres are celebrating their triumphs on one another. Party General Secretary Ram Madhav expressed happiness over BJP's victory. He said that there is no BJP representation in Tripura so far. In such a place, the communists have mud dirt. Devardhnu, who worked as the manager of Modi in Varanasi during the parliamentary elections, has been specially appointed for Tripura. How to strengthen the party at the booth level... The dough hitting Amitsha how to mobilize the workers. He also made special focus on the northeast. 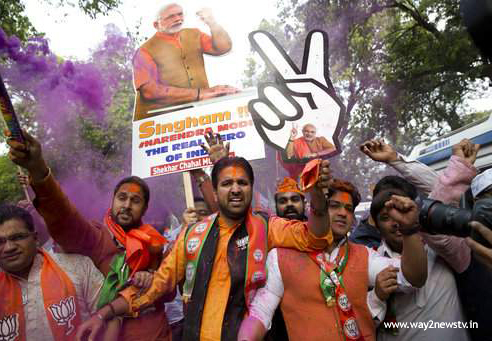 As the elections are approaching, the Modi houses are filled with enthusiasm. Since the states in the boundaries are already flooding, Modi has given more assurances. Overall, Modi's magic continues.